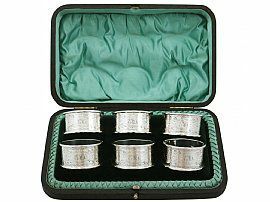 This exceptional set of antique English sterling silver napkin rings consists of six napkin rings, each with a circular form. The surface of each piece is embellished with bright cut engraved interlacing band accented with quatrefoil motifs and stylised foliate sprays. The ornamentation to these silver napkin rings incorporate the contemporary engraved initials 'EHS' to one side. The interior surface of these napkin rings are ornamented with the engraved roman numerals 1-6. The upper and lower rim of each ring is encircled with an applied decorated border. 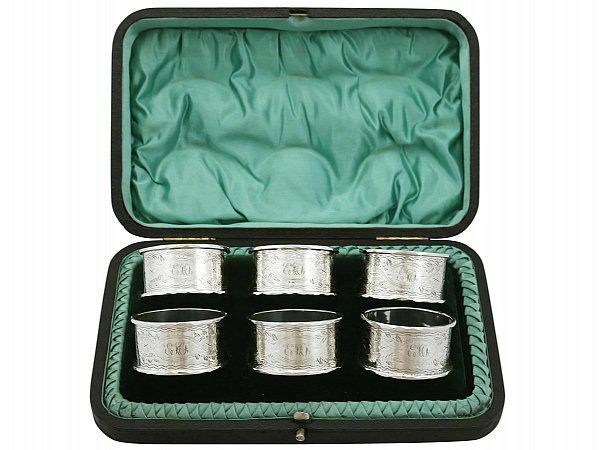 These antique English sterling silver napkin rings are an exceptional gauge of silver and exceptional quality for their type. Each piece has been professionally polished and is in exceptional presentation condition.